Focus Styles on Non-Interactive Elements? 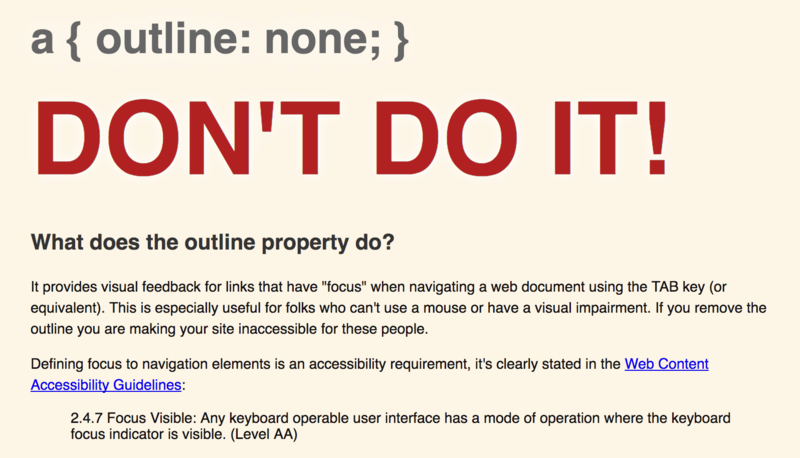 Stopping the browser default behavior is the part that is problematic for accessibility. No longer does the #jump link move focus to element the #jump link pointed to. So Heather added a #4: move focus to the element the #jump link pointed to. Notice the glowing blue outline of the headers that were scrolled to. After the smooth scrolling, the headers that were scrolled to now have the default blue glowing outline that links have by default. Even if we don't always love the blue glowing outline (the style varies by user agent, it might be a dotted outline, for example) we know better to remove it. You can change the focus style if you like, but it's good accessibility to have a distinct focus style for elements that are in focus. I can even imagine an argument for leaving the focus styles alone. They aren't "interactive" elements. We aren't used to seeing focus styles on non-interactive elements. But now, all the sudden, because we used a smooth scrolling technique from the internet, we're getting them. That tabindex="-1" technique to allow focus is causing it. I reached out to Heather to ask her about this. The :focus styling for headings and other non-interactive elements can be removed/left off. It's really up to the folks behind the creative site if they want it or not there. In some cases, I've removed it, in others I've styled it. It just depends. You're safe there. Even in the cases of <a><h3></h3></a> or <h3><a></a></h3>, the link still has focus styles. Which is an adaptation of something that was often used for :target. Why not using default :target selector and leave focus for interactive elements? I’m skeptical that it’s ok to remove focus rings from non-interactive elements. The focus ring serves a purpose beyond just indicating that something is interactive. It helps keyboard users keep track of the focus order. It’s confusing to these users when an element comes into focus with zero visual indication. Imagine that you’re a keyboard user tabbing down a page, and you’ve got three or four of these focusable headers in a row. You tab 3+ times and nothing is happening. At this point, you might reasonably assume that you’re caught in a focus trap somewhere, give up, refresh, etc. Not a good experience. This way I can remove all (or most of) the outlines when the user’s interacting via a mouse. In the given example, probably have to set the attribute on a higher dom. Thank you for this update! It was super timely and kept me from breaking accessibility.